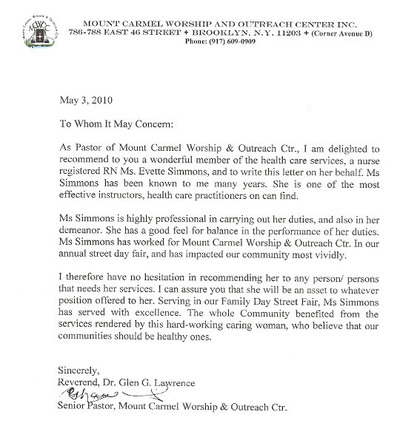 I. April 14, 2009 Ms. Simmons received a Proclamation from the State of New York Executive Chamber, signed by Gov. A. Patterson in observance of National Nurses Week, recognizing RNs and, Nurse Practitoners in New York State striving to ensure positive outcomes for patients. II. Ms. Simmons was invited by the Honorable Mayor Bloomberg to attend the Mayor's State Of The City Address on Jan. 2007. In honor of her great grandfather Moses P. Cobb, known as the first black police officer of New York City. Ms. Simmons was one of the guest of honors who is recognized for her deep roots in central Brooklyn. A museum will soon be built at the expanded Weeksville Historical Society in Bedford-Stuyvesant to showcase family stories as hers. 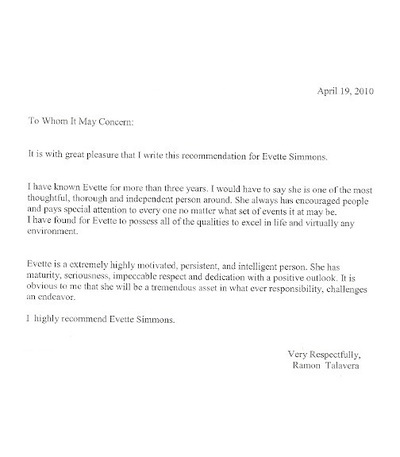 During the Mayor's speech, Bloomberg turned to Simmons and said" Moses Cobb will not be forgotten, neither will be the dedication of Evette Simmons to her family's legacy and, her years of service to the people of New York City." III. Feb. 17, 2004 Ms. Simmons received certificate of recognition from Police Commissioner Kelly for her outstanding and dedicated performance of duty which has brought great credit upon herself and others. IV. Nov. 2003 received educational achievement citation from Police Commissioner Raymond Kelly, in recognition of scholastic achievements in the field of higher education and, acknowledgement of the self-discipline and perseverance applied toward fostering better service to the public through professionalism. V. Ms. Simmons' greatgrandfather Moses P. Cobb is featured in a one hour documentary produced by Northern Light Productions in Boston; aired on the History Channel broadcast in Feb. 13, 2002; hosted by Dr. James O. Horton. The documentary title is 'A Fragile Freedom African American Historic Sites'. VI. Ms. Simmons has a rich family history and mixed ancestry , including African, Irish, and native American Indian heritage. Her grandmother Pearl, gave her a nick name at birth "Red Girl." There is jewish ancestry in her bloodline, via her grandfather's ancestor. Ms. Simmons family history is mentioned in the New York Daily News article Jan. 28, 2001. VII. 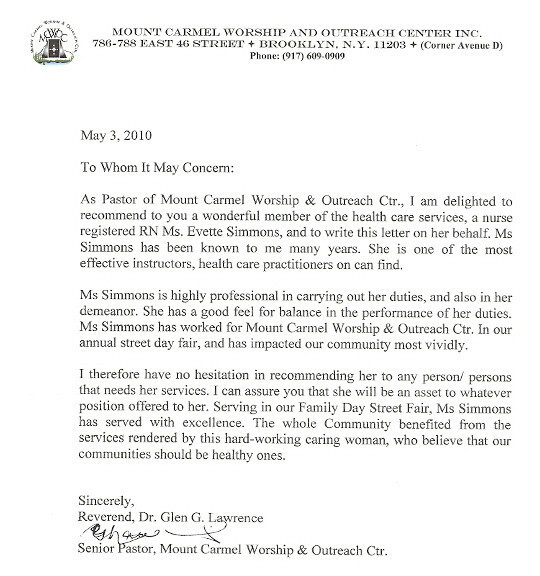 In year 2000 Ms. Simmons received a certificate of appreciation from New York State Nurses Association, for her diligent and untiring works in the interest of Council of Nurse Practitoners. 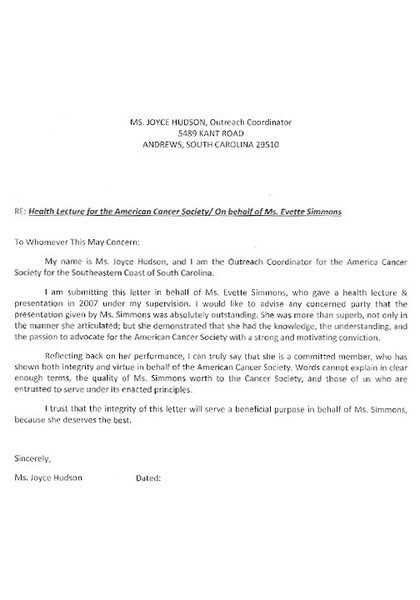 Ms. Simmons is a member of NYSNA and serves as a NYSNA Chairperson since 1994.